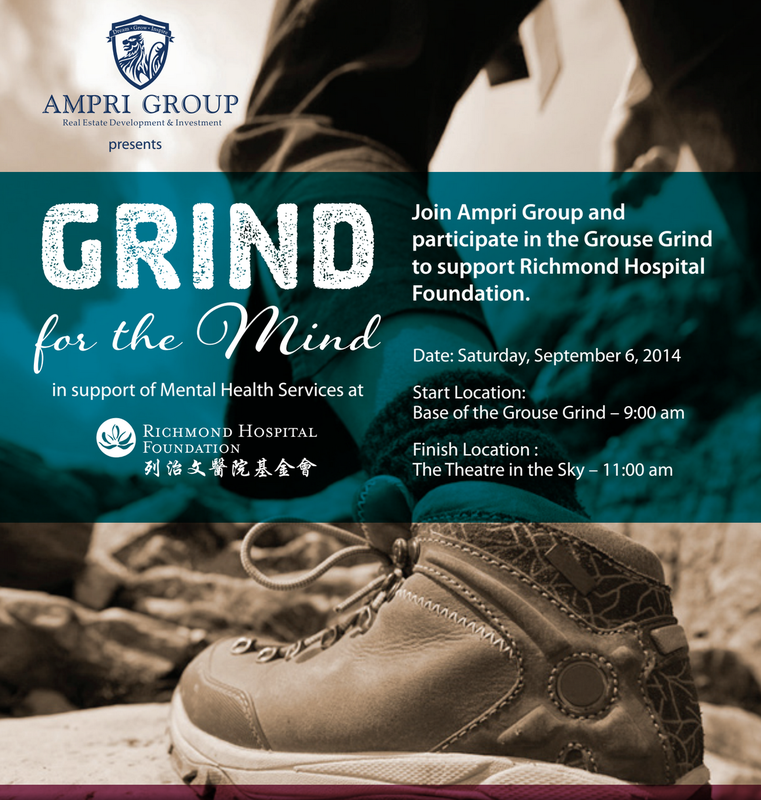 On September 6th, 2014 Ampri Group will be hosting the 2nd Annual Grind for the Mind in support of Mental Health Services at Richmond Hospital. Grind for the Mind was envisioned by Ampri Group’s Founder Paramjit Sandhu as a way to share his passion for hiking while raising funds for an important cause that affects 1 in every 5 Canadians. The event was organized to bring awareness to mental illness and mental health services in our community as well as to promote healthier living through exercise. Hikers will start at the base of the Grouse Grind at 9am, followed by a short presentation in the Theatre in the Sky by Dr. Reena Sandhu of VaultTherapy. Last year over 100 people braved the weather and hiked Grouse Mountain for the inaugural Grind for the Mind in support of Mental Health Services at Richmond Hospital. Through the support of sponsors, Ampri Group was able to raise $30,000 for the Richmond Hospital Foundation. The funds raised through this event will go towards developing an innovative Family Centred Model of Care in the Mental Health Unit at Richmond Hospital Foundation. This new model will help families in supporting and promoting the wellness of their family member affected by a mental illness. To join Ampri Group and the Sandhu Family to bring awareness to mental illness and raise funds for Richmond Hospital Foundation please visit www.grindforthemind.com to donate directly to the foundation or register to participate and raise funds. Hikers may also email [email protected] for a registration or sponsorship form.